First, I'd like to say that it's been really hot in Southern Wisconsin, and we don't have air conditioning in our house. The kitchen seems to be the hottest room and this makes me not want to cook. It also makes me think of cool foods like fruit, salad, iced tea and ICE CREAM. Actually, I wasn't thinking specifically about ice cream until I read my friend Claire's post about making tofu ice cream, and how it was so amazingly creamy and delicious. She made it the hard way by repeatedly freezing and beating it until it was sufficiently aerated to be "creamy and delicious." When I saw the pictures of her ice cream, I became a little obsessed with making something cold and creamy of my own. But like I said, it was just so darn hot. By the time I walked home from work, and we got around to throwing something together for dinner, it was too late and I was too tired and hot to do it. I ended up convincing my husband to walk down to Trader Joe's and buy some soy stuff. 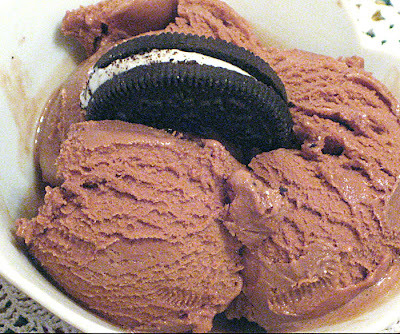 The resulting ice cream was, in fact, creamy and delicious, and it was very easy to make. However, I could detect just the slightest tofu mouth feel, if you know what I mean. My husband had no such problem and loved it. And there is still the little problem I have with tofu as a dessert. But, it's still hot, and a little ice cream, even tofu ice cream, on a hot day can't be all bad. You can find the original recipe here. This is where I got the recipe but I don't know where Marie got it. I can only assume she perfected it herself. If you are using a Donvier or similar ice cream maker, place the canister from the ice cream maker into the freezer overnight. Place all ingredients into a food processor and blend until very, very smooth and creamy. (I can't emphasize this "smooth and creamy" part enough.) Transfer to pitcher and refrigerate to chill for at least an hour. Place frozen ice cream maker bowl onto ice cream maker. Add mix to bowl then start the freezing process. (About 20 minutes) Serve cold and enjoy! Or follow the directions for whatever ice cream contraption you have. Why the changes. My stevia was so old that it smelled and tasted weird so I used 1/2 cup of sucanot and 1/4 cup of agave syrup. I added the extra sweetener because the mix didn't taste quite sweet enough to me. I also used 1/2 of a banana which was probably closer to 1/2 cup. And I put the plastic blade of the ice cream maker into the refrigerator to chill while the mix was chilling. Coming up next: Chocolate ice cream made from cashews. Then, frozen fruit sorbet. Mmmmmmm..... see, now I can't wait to make ice cream the easy way!!! And wait... you went to see and hear the Dalai Lama????? Awesome! Btw, Kailah and Dr. Paster's daughter were in the same first grade class, and played together as kids and then against each other in soccer after we moved. Courtney, Thanks for your comments—and your commiseration.Actually, the humidity hasn't been that bad, only the heat, which seems to concentrate in the kitchen. But today's forecast said "oppressive heat and humidity." At least it's cool in the morning and at night. thats looks amazing! ice cream maker is being added to my xmas list! 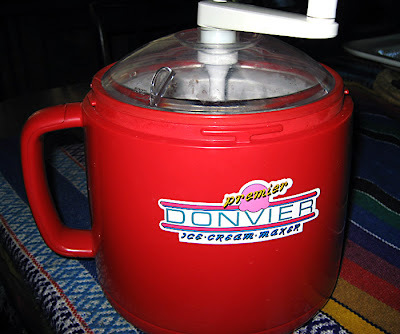 I have a red Donvier exactly like that and use it every day in summer. And I think my daughter was there also, to see the Dalai Lama. Small world. The freezer where we live now is harder to store the ice cream maker in because it's tall and skinny. And the ice cream maker's whereabouts are currently a mystery. So I've been making ice cream in my VitaMix with frozen fruit. Still delicious and refreshing, but different.